Former Montgomery County Council Member Cherri Branson established a campaign committee on June 20. Branson told us she intends to run for County Council At-Large. Branson is a former counsel for the U.S. House of Representatives’ Committees on Government Oversight and Homeland Security. She is also a former President of the Montgomery County African American Democratic Club. In 2014, the Montgomery County Council appointed Branson to fill the remaining time in the term of District 5 County Council Member Valerie Ervin, who had resigned. She is now the Director of the county’s Office of Procurement. Branson had been the subject of speculation for a possible run in District 5 against incumbent Tom Hucker. Her decision to run at-large might leave Hucker with no opponent. Her campaign committee is currently not enrolled in public financing. She joins an increasingly jam-packed field of at-large candidates with more on the way. Council Member George Leventhal, who is running for County Executive, has announced that he has qualified for matching funds in the county’s public financing program. Following is his press release. Montgomery County Councilmember George Leventhal (D-At Large), a candidate for Montgomery County Executive, announced today that his campaign has collected more than 500 contributions from Montgomery County residents, totaling more than $40,000. Once the contributions have been certified by the Maryland State Board of Elections, Leventhal’s campaign will be eligible for more than $180,000 from the Public Campaign Fund. Under the public campaign finance law, a candidate for County Executive qualifies for matching funds after receiving at least 500 contributions totaling at least $40,000 from county residents. Contributions are matched under the following schedule: first $50 is matched 6×1; second $50 is matched 4×1; third $50 is matched 2×1. This results in a $50 donation becoming $350, a $100 donation becoming $600 and a $150 donation becoming $750. Candidates for County Council may also participate in the program and are eligible for smaller amounts of matching funds. Candidates who voluntarily participate in the program must limit contributions to no more than $150 per individual and may not accept contributions from PACs, corporations or labor unions. The first date on which contributions may be submitted to the Maryland State Board of Elections for a determination of eligibility for matching funds is July 4, 2017. Leventhal officially announced his candidacy for County Executive at a kickoff in Wheaton Regional Park on Saturday, June 24, but he has been raising qualifying contributions since October, 2016. First elected to the County Council in November, 2002, Leventhal was re-elected in 2006, 2010 and 2014. His colleagues elected him twice as Council President, in 2006 and 2015. He has served since 2002 as chairman of the council’s Health and Human Services Committee. Prince George’s County Executive Rushern Baker has announced for Governor. His introduction video appears below. Montgomery County’s 2018 primary is now roughly a year away. Many uncertainties have yet to be decided. But one thing is for sure: the two most influential people in the election are not on the ballot. One is the current occupant of the Oval Office. The other is a retired County Council Member whose towering legacy will affect everyone running for county office one way or another. He is the last person who would ever make such a claim, so we will do it for him. He is Phil Andrews. Andrews was a former Executive Director of Common Cause who ran unsuccessfully for council at-large in 1994 but was elected after defeating an incumbent in District 3 four years later. Early in his career, Andrews was a progressive darling, passing a living wage law and a restaurant smoking ban in his first term. Later, he became known for fiscal prudence and authored the county’s public campaign financing law in his last year at the council. Andrews finished third in the 2014 County Executive Democratic primary with 22% of the vote and is now employed by the State’s Attorney’s office. Andrews’s shadow looms large over the coming election in three ways. During his career, Andrews never accepted campaign contributions from PACs or developers. He wrote the county’s public campaign financing law in part to allow candidates following his example to be competitive with traditionally financed rivals. The growing number of candidates who are using it testifies to its popularity. One at-large council candidate, MCPS teacher Chris Wilhelm, even has a petition demanding that all county candidates enroll. One thing is for sure: all county candidates, whether they use it or not, will have to deal with its political implications. During his time in office, Andrews was surrounded by colleagues who freely accepted money from PACs and developers. Now some of those same people are enrolling in public financing. Andrews must feel like a country pastor welcoming reformed sinners to church. After having been in office for a few years, Andrews became concerned that growth in the county’s budget was unsustainable. He began opposing what he viewed as excessive spending, especially on union contracts, and started working against tax hikes. In 2008, Andrews teamed up with at-large Council Member Duchy Trachtenberg to reduce the size of a proposed property tax hike. Two years later, he voted against a county budget partly because it raised the energy tax. The conventional wisdom is that opposition to the 2016 tax hikes was responsible for passing term limits, although the truth is probably more complicated than that. Still, the majority of Democrats voted for term limits and that fact is not lost on new candidates for office. Several of them are leery of more tax hikes and more than one will make an issue of it during the next election. One potential at-large candidate recently told your author, “I will be the hardest vote to get for any tax hike.” Reggie Oldak, running in District 1, has said, “We can’t keep increasing property taxes.” Neil Greenberger, the County Council’s now-former spokesman, openly denounces the 2016 increases. There will be others making similar arguments. How many components of Phil Andrews’s 2014 message will show up in next year’s election? Our bet: lots. In our conversations with those who are running or thinking of running for county office, we have often asked who their favorite Council Member is. Hands down, the winner is Phil Andrews. That choice is made regardless of ideology and even whether the candidate is using public financing. The most common reason cited is his temperament and demeanor in office. “Phil was a grown-up,” said one candidate. Another said, “He could disagree without fighting. It was never personal.” A third said, “He never BS’d you. He told you what he thought and that was it.” That’s all true. His lack of pretentiousness is also mentioned. Indeed, Andrews chose to conduct his first interview with your author years ago in the most humble venue imaginable: the council cafeteria. No steak or cocktails for him (or sadly, for me)! Andrews looks particularly good in comparison to those politicians who argue with constituents or block them on Facebook. In one respect, that was easy for him: Andrews was almost never on social media. Even so, your author has yet to find a constituent who describes Andrews as being anything other than polite and cordial. Regardless of his personal feelings – and there were certainly some who tried to get his temperature up – Andrews never took the bait. While some candidates will cite Andrews on the campaign trail and perhaps even seek his endorsement – probably fruitlessly – there will never be another one exactly like him on the council. His combination of tax skepticism, willingness to do battle with labor, resistance to factionalism, total invulnerability to peer pressure and raw humility is an unusual one in local politics. But Andrews will be able to look at the next council and see fragments of his influence everywhere, with different pieces appearing in different members. Somewhere deep in the rectory, the country pastor just might smile. Following is Hamza Khan’s statement on his candidacy in District 39, which he released today. Over the past few days, I have been contacted by numerous party leaders, elected officials and voters asking me remain in the race for Delegate in District 39 or to alternatively consider running for county council at-large. I wish to express my deep gratitude in the faith that so many supporters have put in my candidacy for public office. In light of these appeals, I have decided that the wisest course of action at this time is to take some time to reflect. I plan to meet with voters and stakeholders in our community in order to discuss the merits of my campaign and seek their counsel, because it is their voices that matter for any decision to be made in our democracy. Therefore, I will make an final decision about running for office later this summer. No matter what my decision will be, I believe that all the Democrats seeking our party’s nomination for delegate in District 39 and for County Council next June are accomplished individuals who represent some of the best our beautiful county and state have to offer. Thanks to many of them, I am excited for the future of our party, county and state. Together, I know we can and will liberate Government House from Larry Hogan, and fight the alt-right agenda of his fellow Republicans in Washington. I look forward to being in touch. District 5 County Council Member Tom Hucker filed for reelection to his current seat on June 19. Hucker’s decision ends speculation that he was considering the at-large race, in which he would have been a formidable contender. It may also lead 2014 District 5 candidate Evan Glass, who came very close to winning, to run at-large. What is currently unknown is whether Hucker will have any challengers. Below is his filing from the state’s candidate list. 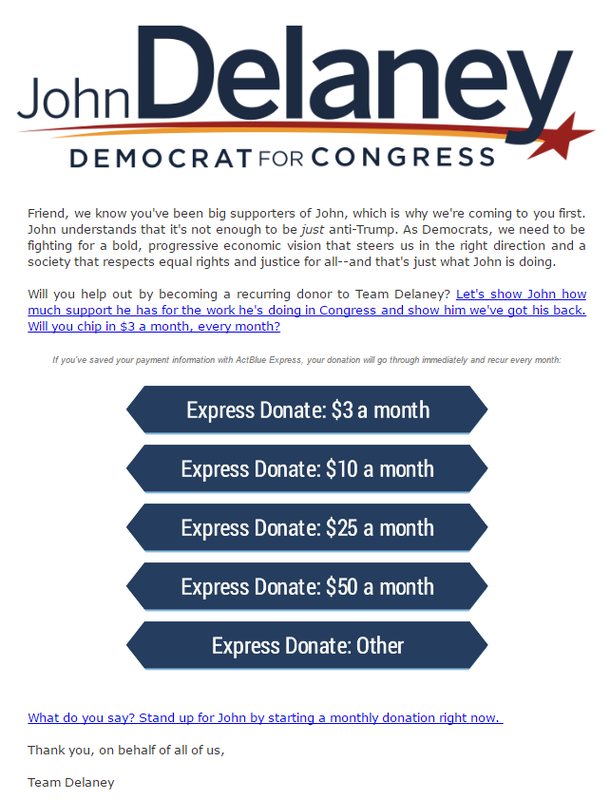 Congressman John Delaney, who is mulling a run for Governor, is continuing to raise money for Congress. On June 15, he sent out the email below asking donors to contribute $3 or more per month to his federal account. As of this writing, Delaney has not yet opened a state account. This comes on top of three recent federal fundraisers for Delaney, including one held at his home in Rehoboth Beach. The obvious question is: if Delaney indeed plans to run for Governor, why is he still raising money for his federal account?